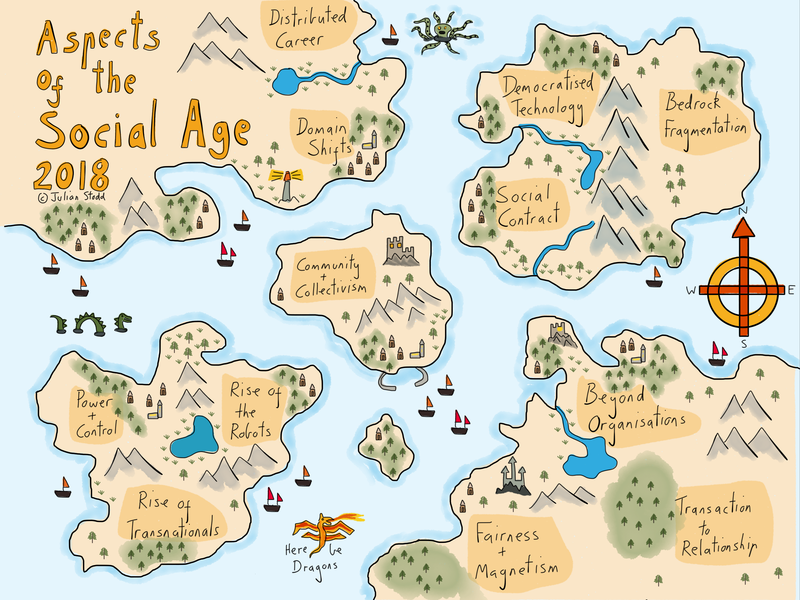 Where will we go, beyond Organisations? Much Organisational Design today is based upon outdated principles of collectivism, and effect at scale, through hierarchy and control, in a world that sees the democratisation of innovation, a rebalancing of power, and evolved modes of social organisation, disrupting those very systems, often in ways we understand poorly, if at all. We will always have a need for Organisations, but the question is, what will they look like, and can we adapt the behemoths of today, to the dynamic winners of tomorrow? In some sense, we can probably characterise the broadest shift as being away from a two party state, to a multi party one: we used to have ‘work’ and ‘not work’, but today, we have a grew space that blends the two. We used to have ‘national’ and ‘international’, but today we have ‘transnational’, and ‘socially global’. We used to have ‘cultural’, and ‘counter cultural’, but today, we rely increasingly on sanctioned subversion, and social engagement, all within the four walls of work. Whatever work is. Whatever the office is. Whatever education is. I believe that the full mechanisms of disruption are reasonably clear, at least clear enough for a cursory understanding: collectivism and the rise of social communities wielding structural power (collectivism outside of formal systems, and the ways that social communities can develop political power back into formal systems), a rebalancing of power, away from purely formal, to a mixed model of reputation (we see a general erosion of purely formal power, replaced by more consensual leadership, even slipping into evolved modes of democracy, not all for the good), democratisation of infrastructure (which used to represent power, but now often represents constraint for older organisations, coupled with democratised, on demand, access for social innovators), emergent modes of social organisation (our older models of social organisation, in States, Nations, Churches etc is being eroded by communities of global ideas, communities of aggregated dissent, purpose led etc), cross cultural connectivity at scale (which will be radically enhanced by synchronous translation), and so on. One view of this change is through modes of social organisation, considering ‘education’, the new ‘guilds’, social ‘tribes’, and future ‘organisations’. At the highest level, the premise would be this: we are likely to see a shift away from formal education being seen as something provided on a national level, predominantly to the young, towards relationships that last a lifetime, provided on a more global basis, and forming something of a continuous backbone to work. Our local tribes will diversify, as the true impacts of collaborative technology, synchronous translation, and narrative artificial intelligence systems bite, providing a new meta culture, and highly trusted network, operating as a home to our sense of ‘being’. The new guilds will emerge as semi professional structures, which not only link into lifelong learning, but gain real political and economic power, holding distributed capability, outside of any formal system, and organisations will themselves reconfigure, to become lighter weight, more adaptive, fully Socially Dynamic. Or at least they will, if they are to survive. 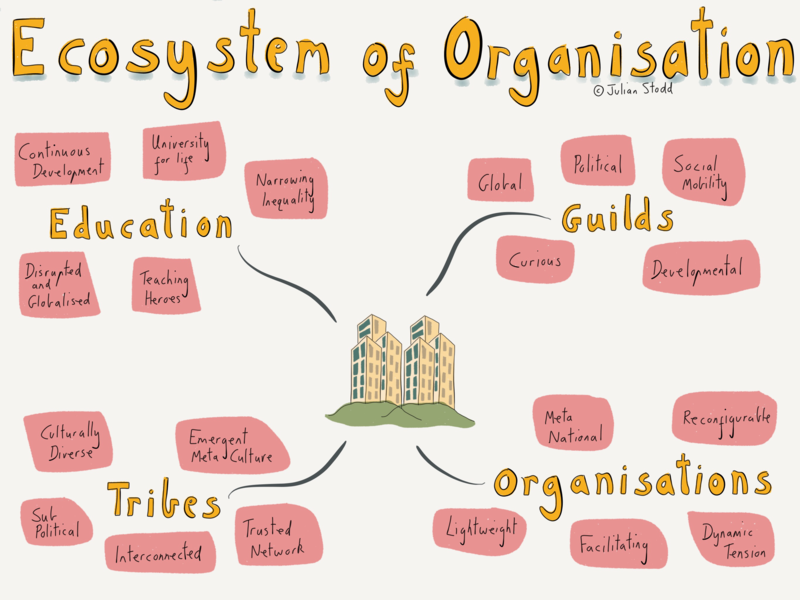 These ecosystem factors will lead to a new environment, one which will favour new models of Organisational Design, and actively sub optimise those that resist, and our challenge is not one for the future, but one to face now: how will we develop and refine the culture that can thrive in this new space? It’s unlikely that we will be able to import it, so we will need to grow it, but we cannot grow it if we hold onto the power, structure, and pride, of the past. We can only grow it if we relinquish certain levels of control, and focus on the dual structure, formal and social, of the Socially Dynamic Organisation. It’s taken nearly two hundred years of scientific management to get us into the current space: we had better start experimenting and learning what comes next. There will be many domain specific challenges around this, not the least of which is the shift from domain specificity to a new generality. The solutions will be enabled by technology, but may be inhibited by IT departments. They will be governed by fairness, but may be constrained by mindless hidebound rule systems. They will be led, but not necessarily by us. Our challenge is to be prepared to change, and most of the constraint we face, as individuals, lies in what we already know, and in organisations, it lies in what we already do. I’m in California this week, running a series of Explorer sessions, unpacking some of the dynamics that feed into this, so will use the time to expand on each of these areas in turn, and try to set some foundations for the conversation to come. 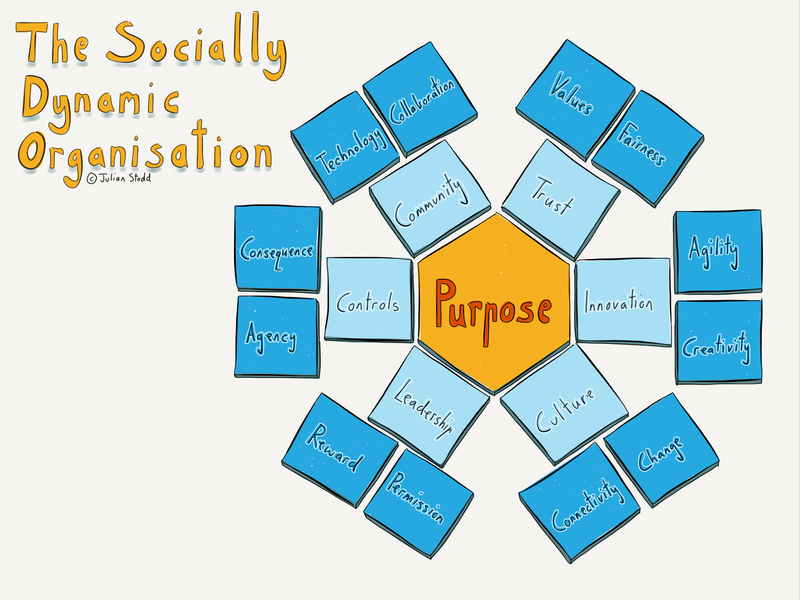 This entry was posted in Challenge, Change and tagged Change, Education, HR, Leadership, OD, Organisational Design, Social Age, storytelling. Bookmark the permalink.